By Peter Geoghegan and Jenna Corderoy: Theresa May is under increasing pressure to clarify reports that she blocked an investigation into Brexit bankroller Arron Banks in the run-up to the 2016 referendum after the Home Office refused to reveal information about the controversial Leave.EU and UKIP donor. 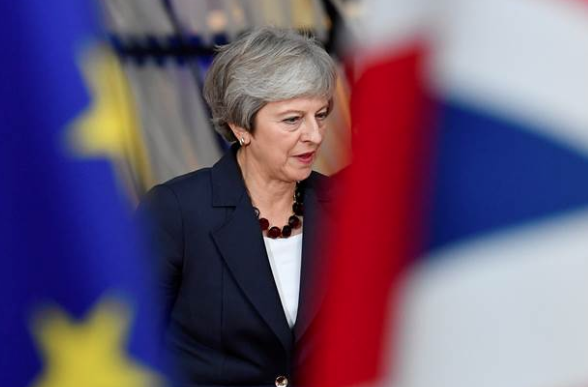 In an effort to ascertain whether there was any truth to the allegations that May vetoed a probe into Banks’s affairs, openDemocracy asked the Home Office for any communications from May’s time as home secretary that referred to Banks or Leave.EU. In response, the department said that even confirming or denying whether it held any information “would impede the future formulation of government policy”. Banks, whose £8.4m gift to Leave campaigns was the single biggest donation in British political history, is facing a criminal investigation over concerns that he was not the “true source” of the money. Questions have also been raised about Banks’s links to Russia. Banks denies any wrongdoing. The NCA probe followed an Electoral Commission investigation that found evidence that Bank’s Brexit funding had come “from impermissible sources”. Last weekend, openDemocracy revealed that Banks raised the possibility of fundraising for Brexit in the US while emailing former Trump adviser Steve Bannon. Donations from outside the UK are illegal under British election legislation. openDemocracy has also revealed that Banks lied to MPs about the political work that his insurance company did for his Leave.EU campaign. After the NCA investigation was launched, a report in the Daily Mail suggested that Theresa May had previously vetoed a probe into Banks before the Brexit vote took place. “The topic was simply too explosive in the run-up to the referendum,” the newspaper wrote. Bradshaw, who wrote to May asking if she had ever declined a request from the security services to conduct a probe into Banks the day after it was announced that the NCA investigation had begun, said that the Home Office’s response to openDemocracy suggested that “the government is trying to hide behind the form of language usually used to avoid commenting on intelligence matters. This is not an intelligence matter. “It is a question about whether the government blocked an earlier investigation into someone who, two years later, is finally under criminal investigation. “This is an extraordinary response from the Home Office and points, I’m afraid, to a major cover-up. How can telling the truth about whether the Home Office blocked an investigation into Banks ‘impede the future development of government policy’? It’s got nothing to do with the future formulation of government policy,” Bradshaw said. 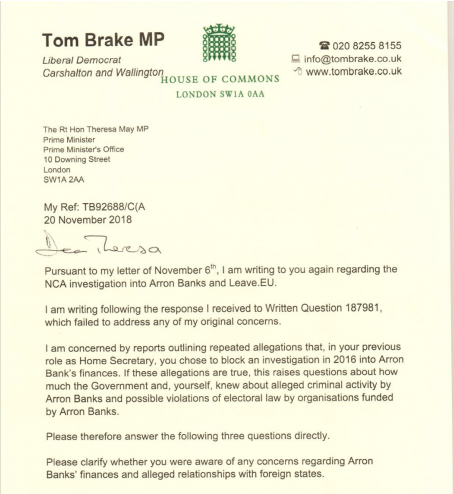 Liberal Democrat MP Tom Brake added: “It is time the government and the PM ditched the obfuscation and came clean with what the PM knew about the Banks allegations when. In September deputy Labour leader Tom Watson also asked whether May had blocked a possible investigation into Arron Banks before the referendum.